WHAT IS A WRITING RETREAT? I should be a little giddy about a new book coming out this Saturday, but mostly I’m just nervous. You can pretty much hide from the crowds when a novel or book of poems hits the shelves because literary audiences don’t usually eat anything you’ve mentioned in your protagonist’s world or alliterative verse. A cookbook, well, you just hope you didn’t recommend mixing ingredients that, when blended together, might cause an explosion. Fortunately for me, Blue Moon Vegan features only tried and true recipes. Still, you never know, so I’m finding safety in recommending my collaborator, Jan Calvert’s recipes, since she owns her own bakery, and if she produced anything explosive, I’m pretty sure I would have heard about it by now. It’s a small town. 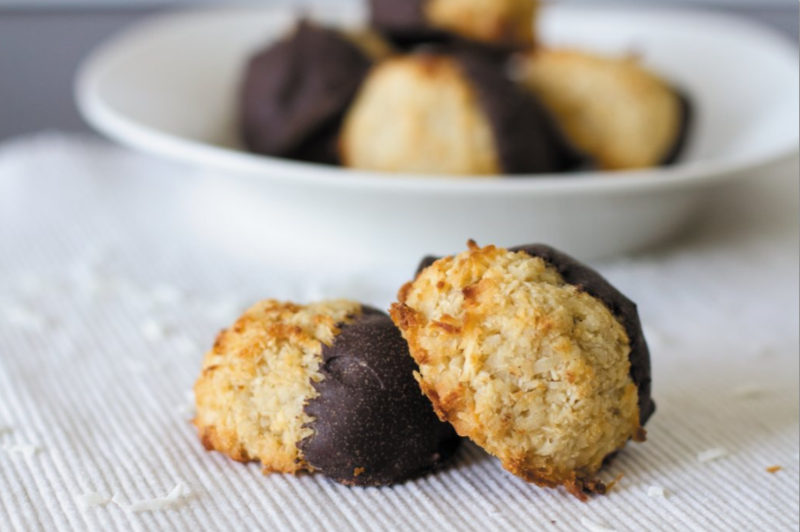 This macaroon recipe is exciting because macaroons normally aren’t vegan. All that chewy coconut is usually held together with egg whites and sugar. Somehow or another Jan figured out “how to make it so,” which is something she does very well. I highly recommend taking a plate of these to the office on Friday, as an early Valentine’s gift to co-workers. They will love you for it, guaranteed. Combine all cookie ingredients in a large bowl and mix thoroughly with a large spatula. Stir and fold repeatedly, until very well mixed. The dough will be moist and sticky. Line a baking sheet with parchment paper or a silicone mat. Dip a cookie scoop or ice cream scoop in water, and then fill the scoop with dough. Make sure the dough is tightly packed so the macaroon will hold together and that the dough is even with the rim so the cookie has a nice flat bottom. Place scooped dough on the prepared baking sheet, using your wet fingers to reshape the macaroon if needed. Repeat with remaining dough. Bake until just turning brown, 10‒15 minutes depending on the size of macaroon you’ve made, and rotating the pan halfway through baking. Let macaroons cool on the baking sheet for 5 minutes, and then transfer them to a wire rack to finish cooling. Makes 20 cookies. After macaroons have cooled completely, line a baking sheet with wax paper. In a small bowl, melt chocolate chips, corn syrup and a pinch of salt in the microwave in 30-second increments, stirring after each 30 seconds, until the mixture is smooth. Carefully dip the top of each macaroon in the chocolate glaze, using a table knife to scrape off any excess chocolate. Set glazed macaroon on the wax paper to catch any chocolate drips . Let cool until set, 30-45 minutes. WHICH WAY IS THE YELLOW BRICK ROAD?
. . . and BOOKS, Too!